Why You Need A Barrie Tax Accountant ? There are many instances in life in which we are faced with the choice of attempting to do something ourselves or seeking the help of a professional. Completing and filing them yourself, naturally means avoiding paying for the services of Barrie Accountant, but if submitted late or incorrectly, the cost to you may well outweigh that of an accountant. Preparing your own taxes is stressful or confusing. After a full recovery from the financial and physical activities of the holidays, professionals and businesses should prepare statements with help of income tax preparation Barrie for April 15. It’s tax season again and how one views this annual activity depends on one’s stage in life and filing level. This activity can be intimidating especially for those who first-timers. With a good tax services Barrie On consultant or tax accountant, one can relax and not worry about those nitty-gritty details. For those who are young and don’t need to itemize, this activity is viewed as nothing more than an obligation to the IRS. But once there is a change in marital status, property purchases, multiple sources of income or additional dependents, then tax preparation and planning can be a huge task to tackle. However, those who have several properties or own some business may have someone whom they count on to make their tax statements. Complex nature of tax law. Changing nature of tax law. The first step is to ask friends and relatives who have some experience in this activity. Appearances are deceiving. Friends and relatives who appear prosperous are not necessarily the ones who have the best tax consultant. After making a shortlist for Barrie accounting firms accountants, the next thing is to research the candidates. Make an appointment to visit their offices. It might be a tedious step but remember the tax consultant will be privy to highly confidential financial information. Before deciding which one, the experience and credentials of the chosen one should be established for calculating taxes Barrie. Look for a person that an essential rapport can be established. RC Financial Group can aid you in difficult, complicated tax problems with arrear taxes owing or any other kind of tax issues that arise. Auditing is an essential accounting tool which aids the client to ensure that their business is running smoothly and does not lack any operational efficiencies and ensures the financial viability of the long-term growth of the business. We offer tax consulting and guide you through the necessary processes involved to resolve any kind of matters. 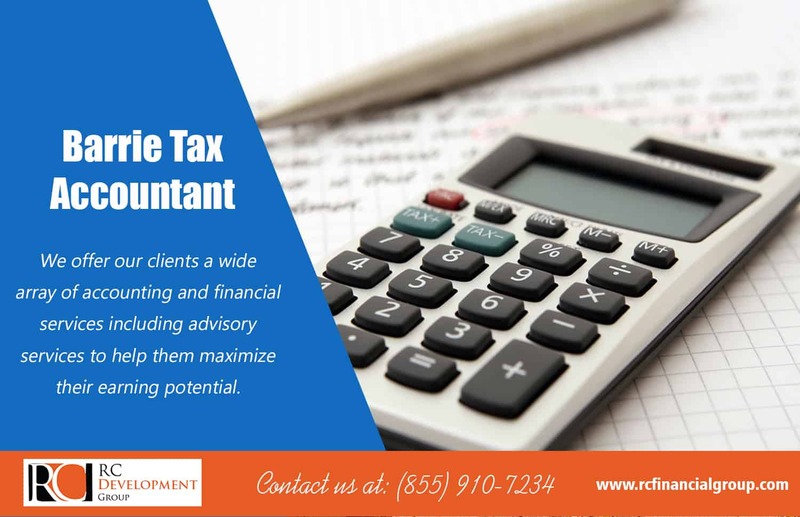 Just like when one is looking for an employee, getting a tax consultant or tax accountant should have some minimum requirements. Some recommended items to look for in the credentials. We are here to assist you with your personal accounting, small business accounting, and other financial needs. A step further is to check with them. National Society of Accountants. Membership is such an authority group is a sign of professionalism. The Better Business Bureau can also be a source of information to find out if there have been complaints on the person or firm. Tax preparation need not be something to be anxious about. As long as you have the right tax consultant with you, then there is nothing to worry about. Assist the tax professional by keeping records in an organized manner. Do not make unrealistic demands unless prepared to provide information and data that can make those demands happen. Good accounting work takes time and effort. Your cooperation and honesty are vital to positive results. A tax consultant is a key person for your financial well-being. Be sure to have the right tax consultant for worry-free tax statements.